Never Enough Nails: China Glaze Road Trip Collection for Spring 2015- Swatches of 3 of My Picks! China Glaze Road Trip Collection for Spring 2015- Swatches of 3 of My Picks! Just a few years ago, my favorite China Glaze collections were always the fall and Halloween collections. Lately though, they've been killing it in the spring department and Spring 2015 stayed true to that game. When I saw the China Glaze Road Trip collection for the first time, I immediately NEEDED a bunch of them. I ended up ordering six polishes and I have the first three for you today. 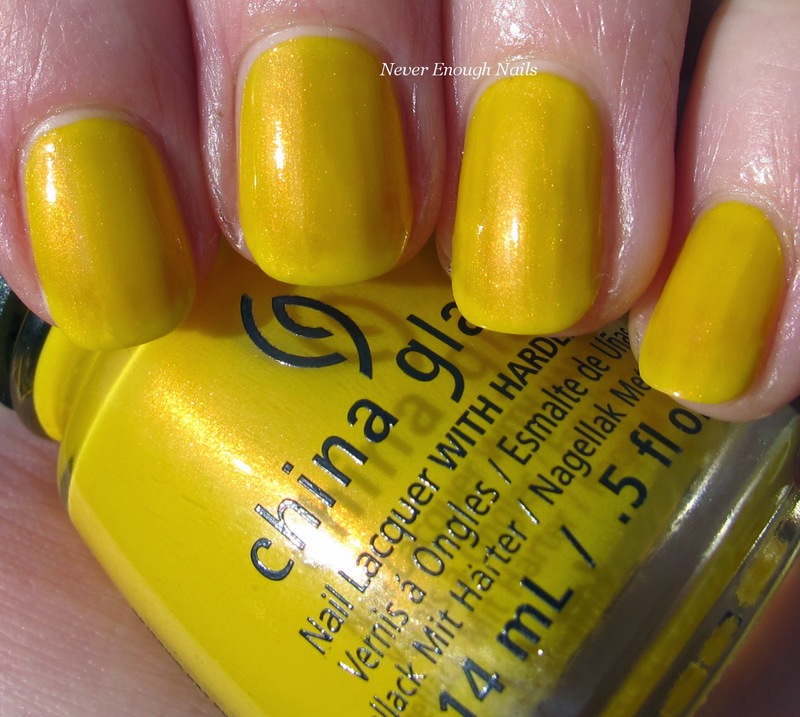 Obviously, I had to have the sunshine yellow with pretty pinkish shimmer, China Glaze Sun's Up Top Down. 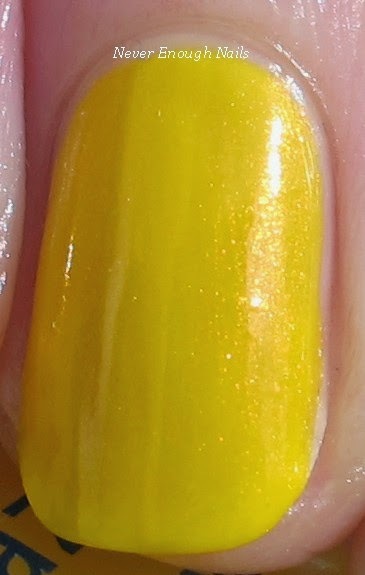 I love a good yellow polish and yellow with shimmer is even better. The shimmer is these polishes is very smooth and a little bit subtle. In low light, you don't see it that much, but in sunlight or brighter lighting, it just glows! The shimmer in Sun's Up Top Down is pinky gold, and it really spices up the bright egg yolk yellow. 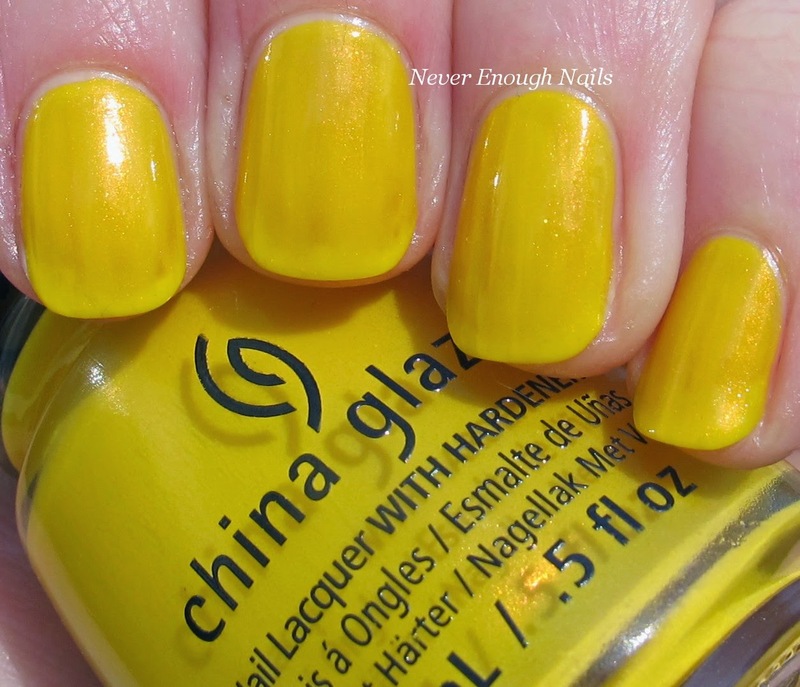 The formula is fairly typical of a yellow polish. It tends to be streaky and it needed three coats for full opacity and evenness. The consistency of all three of these was a little thin, so I had to do some clean up. You have to be a bit cautious to avoid flooding the cuticle. 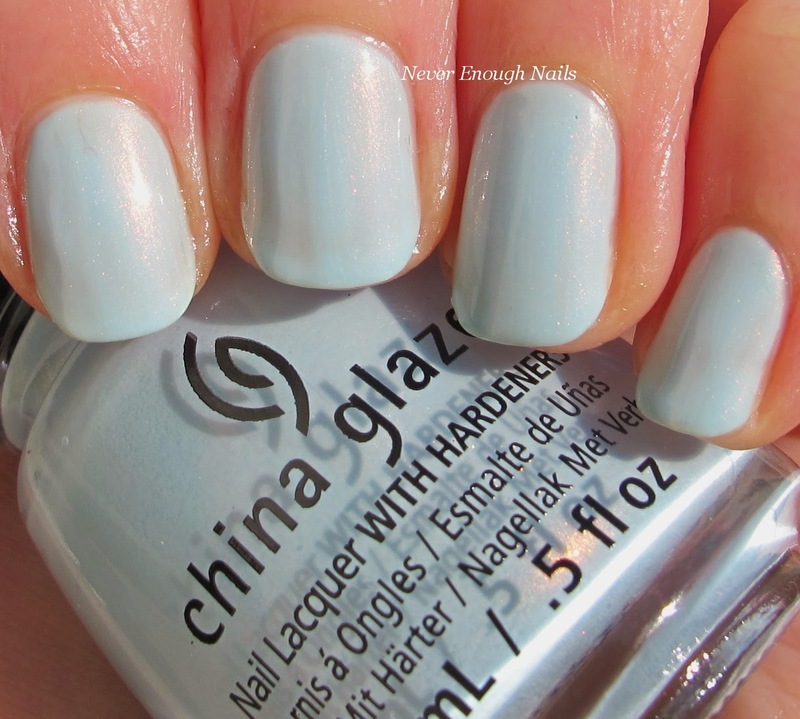 China Glaze Dashboard Dreamer is a gorgeous powder blue with delicate pinkish shimmer. This is so beautiful in person- I think the shimmer is more obvious in person. This is exactly what I want to wear on my nails in the spring. The soft baby blue is so fresh looking and the pink shimmer makes it magical. The color makes me think of the packaging for the upcoming MAC Cinderella collection (NEED! Google this right now! ), so I keep relating this polish to magical fairy tales in my brain. Dashboard Dreamer actually had the best formula of these three. This is three coats, but you definitely could get away with two. I did the third just for my camera, as I could see a bit of unevenness and didn't want it to be magnified in the pictures. This one was not as thin, so it was easier to apply. This kind of pale color can sometimes be a PITA, so I was happy to see that the formula was pretty nice! 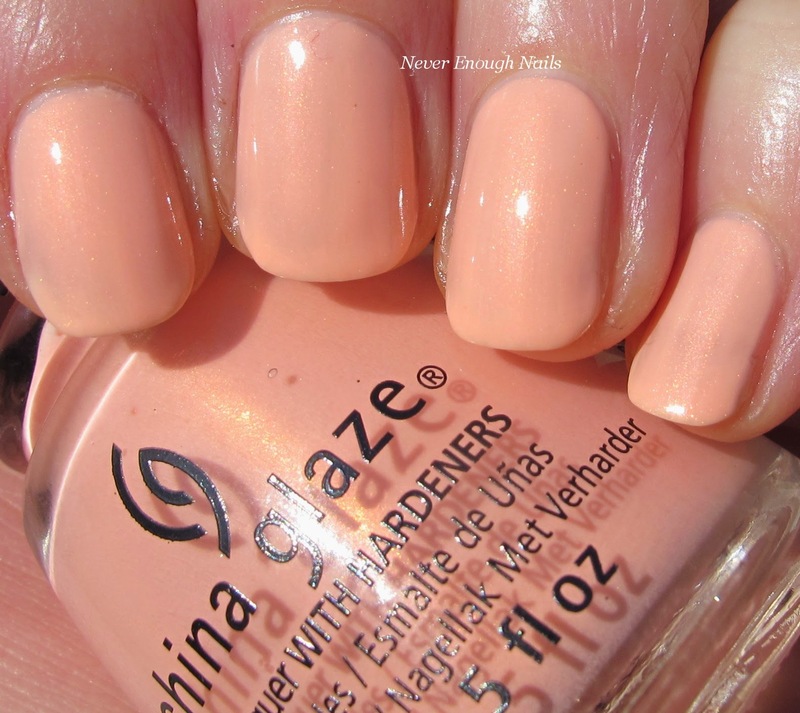 China Glaze Pack Lightly is a pale pinky peach with pink gold shimmer. Pack Lightly manages to look bright and pastel at the same time. It's soft, but not too washed out looking. 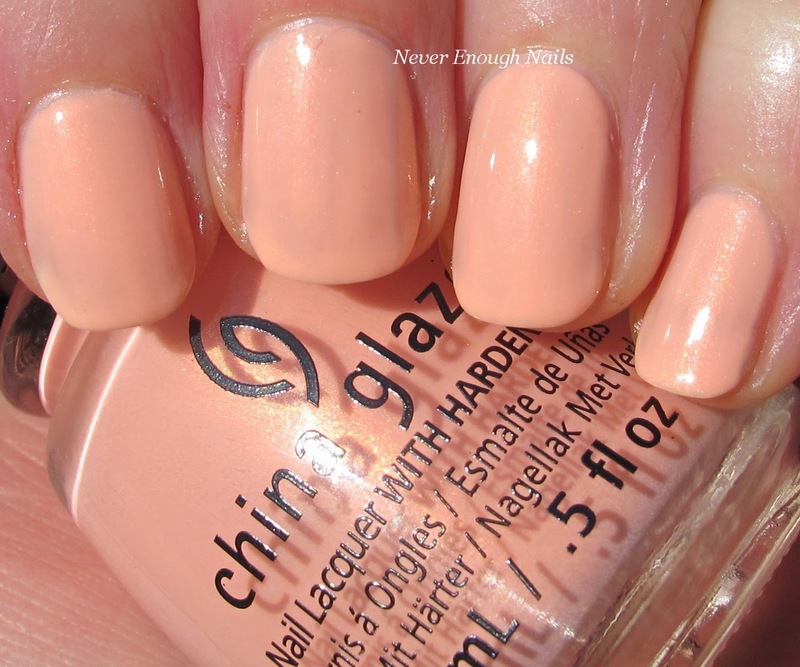 Sometimes with peach polish, it just blends too much with my skin, but this has a bit of brightness to it. Again, I think the golden shimmer is more noticeable in person. If I was pleasantly surprised with the formula of Dashboard Dreamer, I was sadly let down by Pack Lightly. This is actually four coats of color. I did three coats and it was still very streaky looking. So I did a layer of matte top coat and then a fourth coat of color. This is a great trick to deal with streaky polishes, by the way. The first coat of Pack Lightly was also very very sheer, so you will most likely need three coats. The consistency was thin, so you will need to watch out for cuticle flooding. One more note about the formula of all three of these- I would wipe off the brush normally and start painting and after one or two strokes, a huge amount of polish would come rushing down from the brush handle. I tried wiping off the handle too, and it seemed to help a bit, but it still happened. I think this has to do with how thin the polishes are, the polish doesn't stay up on the plastic part, it just comes avalanching down. I LOVE these three colors for spring. I wish that Sun's Up Top Down and Pack Lightly were less thin and streaky, but I know I will still wear them this spring because they are such gorgeous colors. I got my China Glaze Road Trip polishes on head2toebeauty.com. The shimmer is definitely what makes them special!